How much danger would Iranian nuclear weapons pose to the world? This question animates the debate over whether the threat of the Iranian nuclear program is worth robust sanctions or a preventive military attack. 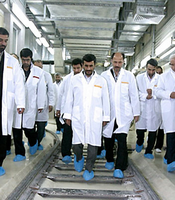 Nuclear weapons are by their nature alarming, and the Iranian regime says and does a lot of alarming things. But how useful are nuclear weapons, even to a state with bad intentions? How much do they change tactical and strategic behavior? For devices capable of destroying cities and killing millions, the answer is surprisingly murky.